petra runs – Page 35 – and writes about it. A quick update from London. I’m piggybacking on someone’s open network at the moment and I never know how long this is going to last for. I have had some amazingly supportive and heartfelt messages from others after my blog was featured on Steve Runner’s goofly little podcast, Phedippidations. Yet another benefit of running and the internet – a worldwide community. But seriously – it’s very moving to feel good karma coming from all over the world. My son is doing well. It has been a harrowing week for all of us but things are beginning to look up. His surgery went well, his doctors are pleased and his prognosis is very good. He is being operated for some major bladder problems and this could be his last operation. Fingers crossed. At nearly 4, he has been incredibly brave and strong and has coped with everything that has come his way in an amazing fashion. He is still in some considerable pain at times, but seems to be coping well and improving. It has been heartbreaking for us as parents at times – it is unbelievably hideous to see your child suffer. But he has, to borrow Steve Runner’s phrase, a truly indomitable spirit and, minutes after suffering a terrible bladder spasm, will be making jokes and playing with his cars. While it has not been a pleasant experience and we would have been happier without it, it has been quite a moving time at the same time. Friends have been incredibly supportive, showing up and spending hours with us at the hospital, deluging us with text messages and support. Strangers have sent me messages of support (see above) which have been incredibly hearfelt and warm. My son is staying at Great Ormond Street Hospital, a world famous children’s hospital which treats children with all sorts of rare diseases. Being here has made us appreciate our own health and how lucky we are that Felix is nowhere near as sick as some of the children here. It is a strange microcosm to spend time in but seeing the dedication and devotion of all of the staff and the incredible courage of the children in facing a frequently unpleasant reality has been very humbling and perhaps a very good insight, particularly at this time of year. Finally – running. 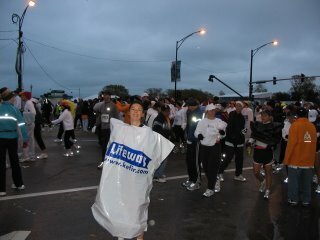 I’m running to and from hospital every morning and night, at about 6:30 am and 8pm. It’s not a long run, 20 minutes, but it’s blissful even in smog and traffic. 20 minutes to switch off and disengage – it’s been wonderful. 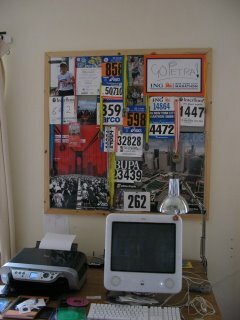 I feel that, perhaps bizarrely, running is giving something back to me. I have put a lot aside to run in the past – I’ve followed schedules and stuck to all sorts of regiments. But now I’ve got this habit which is really helping at a time of stress, and I’m thrilled with it. So long, for now. Run long, and enjoy the fact you are able to and the quality of life running can give you! >running to stay on top..
>The past week has not been great for running. As I’ve mentioned, my 3 year old son needs to go to hospital for an operation and this has all come up rather suddenly. We are delighted that he’s having this operation – he needs it – but obviously, apprehensive about it, worried for him, and the practicalities of leaving my life behind for 2 weeks in December are also a bit overwhelming..
running to stay on top.. The past week has not been great for running. As I’ve mentioned, my 3 year old son needs to go to hospital for an operation and this has all come up rather suddenly. We are delighted that he’s having this operation – he needs it – but obviously, apprehensive about it, worried for him, and the practicalities of leaving my life behind for 2 weeks in December are also a bit overwhelming..
>Whether I started running again too quickly after Chicago, or whether I’m just tired – I’m not sure but I’m definitely not up to standards at the moment. I managed a good 45 minutes yesterday (in the driving rain and knee-deep in mud – there is something about very unpleasant conditions that seems to work for me) but this morning 30 minutes was all. It’s not that anything hurts – it’s just that I seem to wear out very quickly. I am tired, I think. Also a bit disappointed as I was going to run a cross-country race today but my son was ill so I felt I should stay home with him. There’s a sickness bug going round and I just hope that today’s illness won’t prevent his admission to hospital next week…. I suppose I should surrender to the universe here, whatever will be will be. Going back to running – looking back on what I’ve written I think that regardless of why I’m so tired – poor health or lack of sleep or overtraining or left-over exhaustion from Chicago – I need to take a few days off. Sleep, live healthily and see where that leaves me. Hopefully my next post will be perkier.. Till then, happy running! Whether I started running again too quickly after Chicago, or whether I’m just tired – I’m not sure but I’m definitely not up to standards at the moment. I managed a good 45 minutes yesterday (in the driving rain and knee-deep in mud – there is something about very unpleasant conditions that seems to work for me) but this morning 30 minutes was all. It’s not that anything hurts – it’s just that I seem to wear out very quickly. I am tired, I think. Also a bit disappointed as I was going to run a cross-country race today but my son was ill so I felt I should stay home with him. There’s a sickness bug going round and I just hope that today’s illness won’t prevent his admission to hospital next week…. I suppose I should surrender to the universe here, whatever will be will be. After such an ambitious start to the week, running slowed down a bit by the end of last week. I got up at 6:30 to run on Thursday morning but I was shocked to see it was still pitch black outside. I do have a headlight to run with but I don’t like it – bumping along tends to compress the springs inside and the batteries lose contact and turn off the light, for one thing – and only really use it during marathon training when darkness is no excuse. The other thing is it just gives me the heebie–jeebies running through the dark, it reminds me of the mildly scary movies which freak me out for months (the Village, in particular) and also the beam reflects the eyes of all the little animals hiding out in the woods and spying on me – very scary stuff.. So, I didn’t go out in the morning and that was my moment gone – I had my 3 year old with me for the rest of the day. Friday I spent all day cooking for a dinner party I was hosting that evening and I didn’t get a chance to get out either (though probably could have made the time..). Which brings me to my topic of the day – how your lifestyle affects your running. Normally, I get to bed around 9:30 / 10pm, up at 6/7 am and eat healthy food. I try to moderate my drinking and run pretty much every day. I do adore cooking though and this week I had decided to cook cassoulet for my friends – delicious, wonderful, not too fatty or greasy but nonetheless extremely filling. We had such a good time, drank champagne and lovely red wine and the guests didn’t leave till 1. Now for me, this is disastrous. We’d been out on Thursday night (bed at 12) and now this – Saturday morning I was a zombie. Adam had to be out all day, so I dealt with the kids all day – by 4pm I was a wreck. I did try a 15 minute run first thing but I had zero energy. Alcohol, rich food and no sleep do not a marathoner make. Clearly. Sunday was much better – I did my first 1 hour run since the marathon, and now I’m back on track. But with the Christmas season ahead I can see I have to watch myself. I’m a complete sucker for champagne, and the English are so generous with it at Christmas parties .. I so want to keep my running up in between training programs as well this year – I lost most of the first 5 months of this year to injuries and lack of motivation and I don’t want to do that again. Besides, my son is going to London for surgery in a few weeks and I’ll be staying with him the whole time – for a stressful period like that it’s important that I’m strong, healthy and well-rested. It’s going to be hard while I’m in London – I’ll be sharing his bedroom in hospital – but I shouldn’t compromise things further.. Famous last words? Look – I’m not promising to stay on the wagon for December (that’s what January’s for) but I’m going to try and keep it steady. Got my first cross country this Sunday – I’ll be posting about how that went.. The new leaf is hanging on..
Yesterday’s workout with the Lincolnshire and District Runners was another good one – a decent 60 minute run with some speedwork thrown in. Don’t like running on the roads and pavements though – it’s pretty hairy and we seem to keep running red lights. Memo to self – wait at the lights and use the catchup to the group as extra speedwork..
After last night’s exertions I decided to carry on in the new vein and did 25 minutes of hard interval work on my crosstrainer. I bought it last year when I was injured and desperate to keep up my levels of fitness. It’s not half as much fun as running and I find it harder work but it’s really good for interval work – I think I push myself harder than I would outside, certainly by myself. I put some podcasts on to listen to and went for it and feel the warm glow of exercise success now. 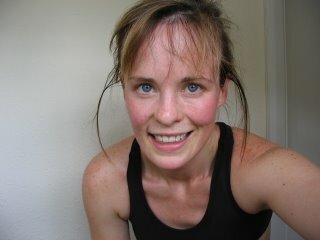 I even had the presence of mind to take a photo of my sweaty face a few minutes afterwards.. I feel I’m getting back into the swing of things and am even quite excited about doing more speedwork. I’ve put it off for so long, feeling that it was something I was awful at but I’m done with that kind of thinking. I didn’t think I could run and I’ve done 2 marathons, so I’m not going to be vanquished by speedwork. I’ll never win any medals but that’s not going to stop me. Cross country in 2 weeks – only about 6K apparently so I could treat that as a speed session – we’ll see. In the meantime, nice and easy runs tomorrow and Friday, day off on Saturday and then a long run on Sunday. I’m back in the saddle..
Last night I met up with local running group for the first time. I have resisted running in a group before because I a) enjoyed running alone b) didn’t feel I had the time to travel to a meeting point and c) felt I was too slow.. After Chicago I changed my mind. I know I’ve gone on and on about it but it truly was an amazing experience and it has left me hungry for more. Don’t get me wrong – even at 8 months pregnant Paula Radcliffe need not worry that I’m snapping at her heels – but having run so much better than I had thought I could in Chicago, I now wonder whether I really could do even better with some help from other people. Also – much as I love my own company, running with others once a week is beginning to seem quite attractive to me. At least I can talk about running equipment, races, gadgets, podcasts etc. without boring the pants off of my audience, which is what happens to “regular” friends – and I don’t blame them for being bored. The stuff I like to talk about to other runners and on running websites basically puts me on a par with trainspotters and car enthusiasts – the intense focus on a single interest is quite creepy and suspect. So – enough self-justification I think. It was great! We met at a local sports centre and everyone was really friendly. We went out for about 6 miles and did some fairly painful speedwork in the middle. Towards the end one of the guys really goaded me into running much faster than I intended to which was exactly the sort of challenge I was looking for. He also told me about all the races they run and the thought of doing some cross country this winter is actually really appealing. So I’m going to stick with it. They meet twice a week which seems pretty unworkable to me – I’ll make one a week I think. So on I go – into the Christmas season. Just been out for half an hour which was quite a struggle. It never ceases to amaze me that some days I can go out for 2 hours very happily, and the next day 15 minutes will seem impossible.. However, it seems criminal not to run at the moment as the weather is lovely and the farmland round here is just so beautiful. In fact, if I remember, I’ll take my camera out with me tomorrow so I can show you what I see when I run. The marathon is behind me but the buzz remains.. In short – I had a fantastic time. 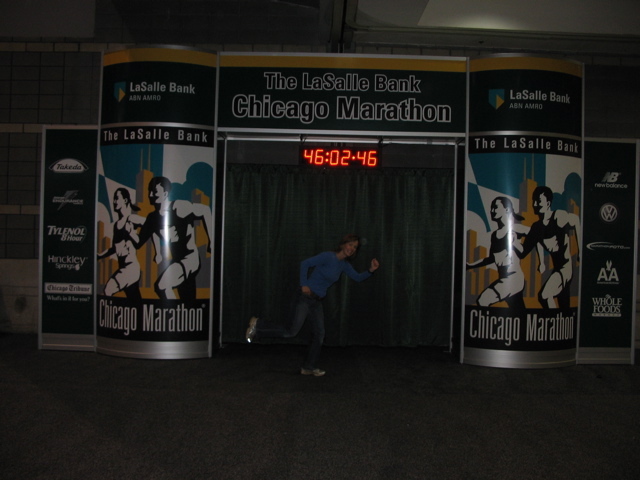 The expo, which took place 2 days before the race, was wonderful – if you’re a runner and a consumer. My mother and I are both, avidly, so it was just wonderful. All the main sports brands had stalls selling their running gear as well as masses of other brands selling sportsfood, other kinds of food (peanut butter? ), hair grips (yes – and they are fantastic) etc. There were all sorts of cool freebies – magnets, stickers, bandaids – we were walking around with huge bags full of booty. Then there were also stands for various other marathons and for some running writers – I had a chance to have my Marathon book (which I had used to train with) signed by the author, Hal Higdon. He was lovely and very encouraging. Then I met John “the Penguin” Bingham – the man who set me off running in the first place. He is a slow and awkward runner who gives great support to those of us who are not within sight of Boston qualifying times.. An article written by him on the merits of running slowly was what got me started running 3 years ago and it was great to meet him. He was very kind and friendly and we spent some time talking to him about the marathon and Chicago. At the expo I also signed up for the 4:30 pacing team – these teams are led by local runners who stick meticulously to a given pace so that you can help to pace yourself through the race. I felt quite ambitious signing up with this team but also felt that aiming for a 4:30 finish time was fairly realistic given the pace I’d run in training. The day of the marathon itself started very early (I was bold upright by 5am) and was very very cold. 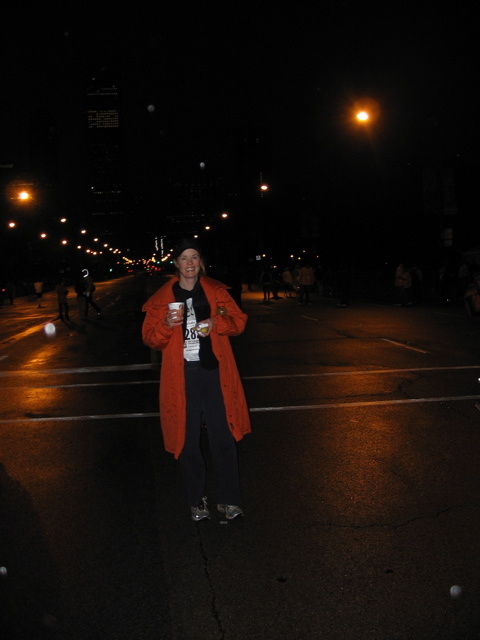 Walking to the start in the dark with my mother the wind was whipping around us and I didn’t talk to her about the weather – I didn’t want to state the obvious fact of how awful it was..
As a result, I never saw my team of fans – my mother, Jeff and Brian and John who had trekked all over Chicago to see me but who obviously did not realise I was going so much faster than I had anticipated. 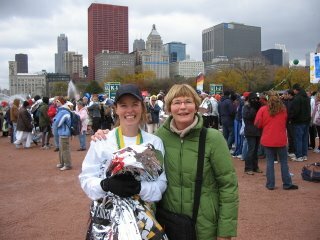 We met each other fairly quickly after the race, however, and they all very patiently listened to my excited tales of the marathon. 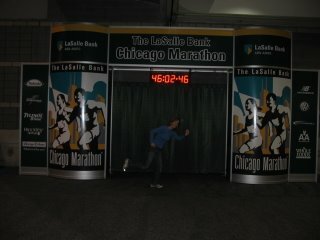 On average, my pace was 9:49 minutes per mile. I placed 15909 out of 33,633 contestants in all, was number 4925 out of 14724 women, and placed 901st in my division of 2475 women between 35 and 39. Very cunning that last placement – I turned 35 3 days before the marathon so just made it out of the young gun division in time.. It was such a different marathon from NYC – the cities are so different in look and feel, NYC is a very international marathon and this is very American, and the weather was diametrically opposed – it is impossible to compare them. However, doing better than I had hoped gave me an enormous high and I can still feel it. Running a marathon is such an intense experience psychologically and when it goes well there is very little in life that compares to the sense of physical power and achievement I felt. Having always thought of myself as athletically incompetent it is astounding to myself that I can do this – and I can only conclude that if I can, anyone can. Honestly – had you seen me 3 years ago, 3 stone heavier and so lacking in self confidence, you wouldn’t have dared tell me I could be capable of this. What next? After a rest I will be spending the winter concentrating on speedwork (which I have avoided so far) and building some upper body strength and I will be looking to run another marathon, all being well, next autumn. Suggestions for venues are welcome!